U-1224WCB-00A Features: -1000 Series collection. -Digital touch pad control is conveniently located on upper face of unit. Product Size: -Compact. Finish: -Black. Primary Material: -Stainless Steel. Cooling System: -Compressor. Interior Light: -Yes. Temperature Zone: -Single zone. Wine Bottle Capacity: -48. Outdoor Use: -Yes. Country of Manufacture: -United States. Number of Shelves: -6. Defrost System: -Automatic/Frost Free. Temperature Display Type: -LED. Dimensions: Overall Height – Top to Bottom: -32.13″. Overall Width – Side to Side: -24″. Overall Depth – Front to Back: -23.25″. Overall Product Weight: -123 lbs. 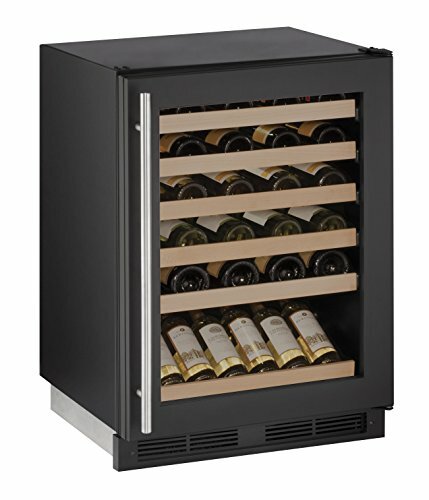 Buy U-Line U1224WCB00A Built-In Wine Storage, 24″, Black at Discounted Prices ✓ FREE DELIVERY possible on eligible purchases. U-1224WCB-00A Features: -1000 Series collection. -Digital touch pad control is conveniently located on upper face of unit. Product Size: -Compact. Finish: -Black. Primary Material: -Stainless Steel. Cooling System: -Compressor. Interior Light: -Yes. Temperature Zone: -Single zone. Wine Bottle Capacity: -48. Outdoor Use: -Yes. Country of Manufacture: -United States. Number of Shelves: -6. Defrost System: -Automatic/Frost Free. Temperature Display Type: -LED. Dimensions: Overall Height - Top to Bottom: -32.13". Overall Width - Side to Side: -24". Overall Depth - Front to Back: -23.25". Overall Product Weight: -123 lbs.